With the launch of its YouTube Red subscription service, YouTube has embarked on a new round of content commissioning, working with its online stars, multi-channel networks and traditional producers alike to source shows that will persuade its viewers to start paying. YouTube’s global head of original content Susanne Daniels gave a keynote at MIPCOM today to talk about the company’s strategy, and the wider evolution of original programming online. She was joined by Lionsgate Television Group chairman Kevin Beggs to talk about a new partnership, as well as Burnie Burns, chief creative officer of video game-focused production studio Rooster Teeth, which has been one of the success stories in the online-video world. These projects often pair top YouTubers with “Hollywood’s finest” production companies: for example gamer PewDiePie working with the production company behind The Walking Dead. Daniels also said the YouTube community is driving the diversity of its content. For example, one show with an all-Asian cast was turned down by Hollywood, but attracted millions of fans on YouTube. One of the YouTube Red shows is Broke, which has been praised for its “authentic African-American roles” according to Daniels. She also pointed to a documentary set for 2017 called Gigi Gorgeous, about the transexual actress, model and YouTube personality. 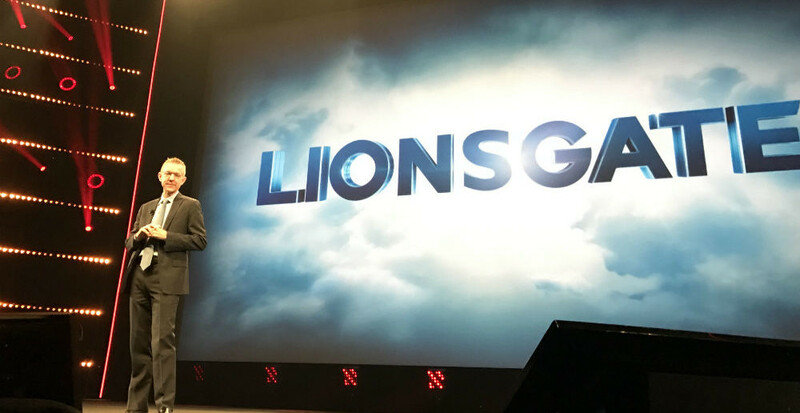 Lionsgate has worked with a number of YouTube stars in film and television, and its new project is a spin-off from feature-film franchise Step Up – an idea that several TV networks have chased in the past, according to Beggs. “Step Up is now going to air on the platform where it belongs,” he said, of its in-production YouTube series. Rooster Teeth’s Burnie Burns took the stage next to talk about his studio, which he set up with his best friend in 1997 to make their first feature film. “I quickly found myself devastated by the process of trying to get that movie out in front of an audience just to get it seen,” he said. But through making web videos, Rooster Teeth realised that the internet could be their distribution channel. Rooster Teeth also raised $2.5m on crowdfunding site Indiegogo for its Lazer Team film, showing the power of that community, with Burns noting that the fans didn’t just fund the film: they went out and persuaded cinemas to show the film when it went on theatrical release, helping it deliver the best box-office return yet for a crowdfunded movie. Daniels returned to the stage. “How are they performing? Over the last year we’ve seen our original series becoming one of the leading drivers of YouTube Red subscriptions, and viewership that rivals US cable shows,” she said. YouTube Red subscribers are also watching 75% more YouTube on their televisions than the average YouTube viewer. “By the end of the year we will have released over 20 new projects,” said Daniels, with three of those shows already having been renewed for a second season – including horror-survival show Scare PewDiePie. Daniels also talked about some new series, including comedy-drama Game Grumps, following a newly-formed team of eSports players, and a show from Dwayne “The Rock” Johnson, who is executive producing an action series about a life insurance company that sends its agents forward in time to prevent the accidental death of its clients. As she noted, The Rock isn’t just a Hollywood star: he has a thriving YouTube channel and fanbase too: a sign of the times.